Is it okay? For the most part I think it’s fine as long as you’re not going to extreme measures to drastically alter your appearance for the sake of pleasing others. I’ve put thought into how I present myself in pictures a lot as have so many others, and it’s not just about using Photoshop to hide blemishes or using the “liquify” feature to tighten up curves. It could be as simple as using an Instagram filter, or angling the camera and framing one’s face/body a certain way in order to present yourself in what you consider to be an optimal position. Can’t see the video? Watch it here. Degrassi’s lifestyle channel The Dot TV also talked about altering your appearance for photos being posted online…you can watch a group of young adults discuss below. They want to know your opinions on divorce! Details on how to submit your video are below and on Degrassi’s Facebook page. Divorce: 40-50% of families go through it and it can be tough. We all cope differently – Has your family been through divorce? How did you handle it? What were the best ways you learned to get through it? 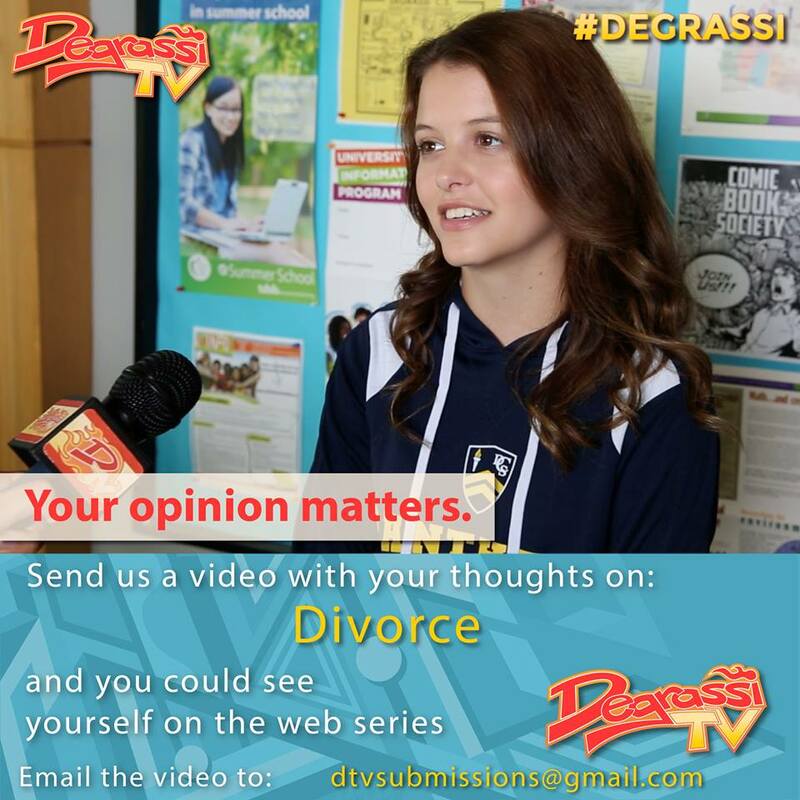 Send us a video with your thoughts and it could be in next week’s Degrassi TV! Please film your video HORIZONTALLY (phone sideways) and ensure videos are between 30 seconds and one minute in length. The submission period begins June 23rd, 2016 and ends June 26th, 2016. You must be over 13 years old to submit a video. Video selection will be at the producer’s discretion. *Please note that by submitting your video you consent to your likeness being used for the purposes of Degrassi TV.